2. 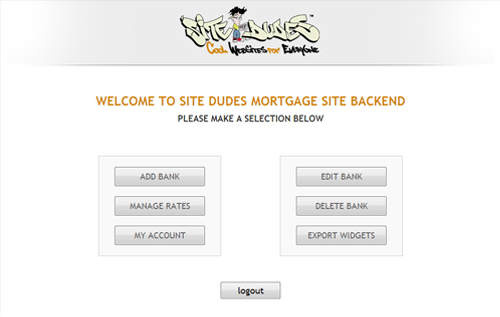 Click on "Add Bank"
3. Fill in the credentials of the bank you would like to add. Once done, click on the Submit Button. 4. Click on the "Home" Button and you will return to your dashboard. 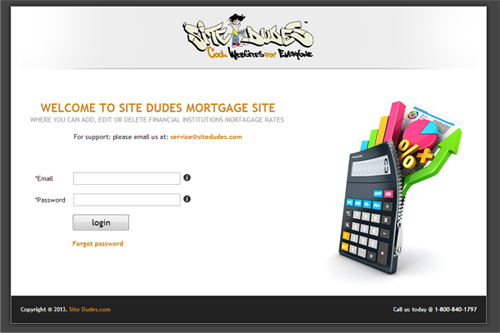 Once loaded, click on the "Manage Rates" tab. 5. Select the bank you have created. 6. Review the bank information you have added. Below the information, are rate fields that you can now fill in. Input your term, rate and a comment if you choose to do so. 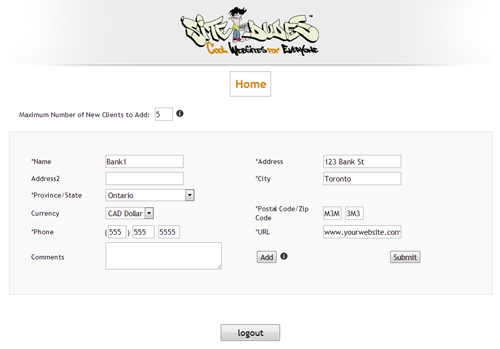 Once done, you can click "Add" to fill out a second rate, or Submit the information. 7. 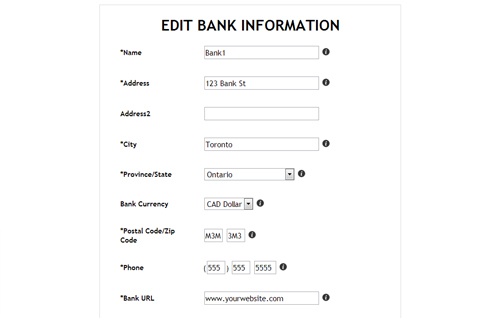 To Edit a banks information, on your dashboard, click "Edit Bank". 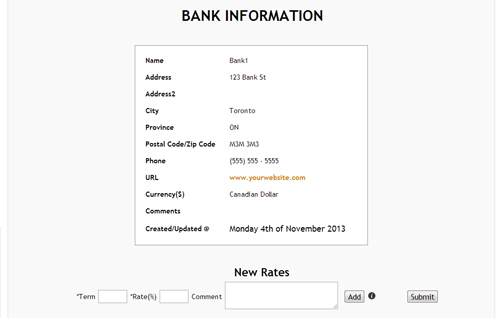 Here you are able to change information about the bank(s) you have added. Once done, click "Submit". 8. To delete a bank, on your dashboard, click "Delete Bank". Select the bank you would like to remove, and click "Submit". 9. Now you have your bank and its rates filled out. It's time to see how it will look like on your website! On your dashboard, click on "Export Widget". You will then see this screen (Below). 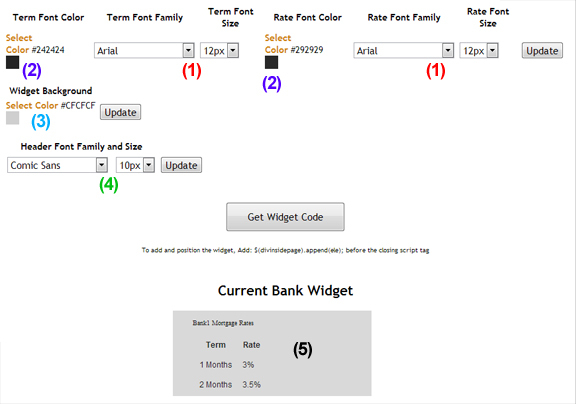 After making any change to colour, font and font size, click on the "Update" button next to the option you are changing. 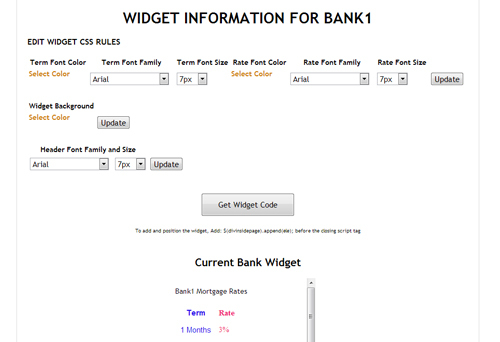 Once selections are made, you will then see how the mortgage rates widget will appear on your website (5). You are now done! 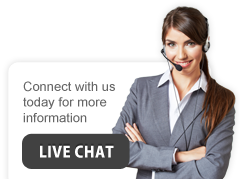 Visit your website to see the changes you have made.